My dad and his partner Angela have a beautiful cottage nestled in the Lincolnshire countryside with all manner of flora and fauna adorning the gardens. Amongst the buddleia, apple trees, and foxgloves are many busy busy bees who call the hive at the end of the garden home. I was very fortunate to have been given some beeswax Angela had saved me from her recent collection of honey. Thankfully, as part of the separation process Angela had already put the wax through some cleaning but as you will see in the picture below there is still some left to do! I didn’t want to give myself too much of a rigid plan in terms of the product I wanted at the end, but it made sense to try and make something I could really make good use of so I skin lotion was the aim of the game. I watched a fair few YouTube videos on how to clean the wax but there are so many different techniques I just decided to wing it and use what I had available to me. So the following tutorial explains the process I undertook to create my own DIY hand and body lotion. If you happen to be making something similar and already have beeswax you can skip this section entirely. For all of these things I strongly recommend you use ones you are not bothered about chucking away as this is a very messy job! 1) First things first, put your protective gloves on, it makes life so much easier when you don’t have sticky hands! 2) Wrap the beeswax up in a dishcloth so that you can wash it without losing any in the water. 3) Fill the bucket with very warm water (needs to be warm enough to make the honey runny). 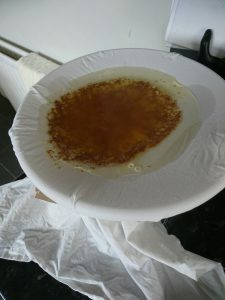 4) Gently wash and squeeze the excess honey out through the dishcloth. 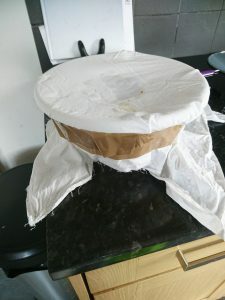 5) The water will start to turn a murky colour and once you feel like most of “stickiness” is gone you should quickly unwrap the beeswax so it doesn’t cool and stick to the cloth. Chuck the murky water outside and not down your drains! 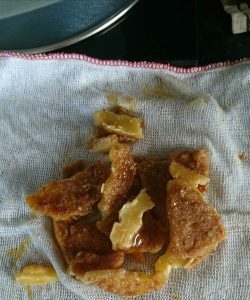 6) Next before you melt the rest of the honey residue off your beesawax you should prepare your microwave proof bowl to act as your filter. Take a clean dish cloth and tape across the top of the bowl. I started off with an old pillowcase, but I found the knit of the fabric too close and the wax was settling on the fabric rather than dripping through. 7) Place a saucepan with water and a bowl on top on the hob (much the same as if you were melting chocolate). Keep the temperature on medium so as not to boil the water straight away. 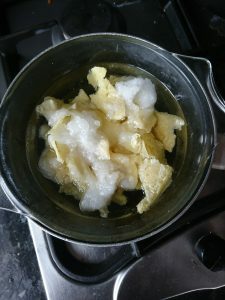 8) Break your washed beeswax in to small chunks and place in the bowl over the saucepan. Then pour warm water so that it just covers most of your beeswax. 9) Let the wax melt in to the water for around 20 minutes. You should be left with a sticky, gritty looking mess. 10) Next pour onto the dishcloth of your prepared filter bowl and let it drain through to the bowl below. Now leave this to set for an hour. 11) Once it’s set the wax will be separate from the water leaving a nice wedge of wax at the top and water sloshing around beneath it. Remove the wax and pour the gritty water away – again preferably outside and not down your drains! 12) Break the slab of wax down again in to smaller pieces and repeat the melting process over the hob with water to cover. 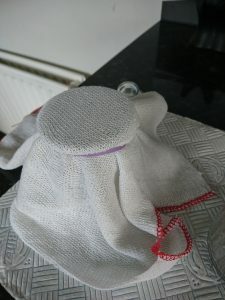 Whilst this is melting you will need to replace the dishcloth you used on your filter with a new clean dishcloth. 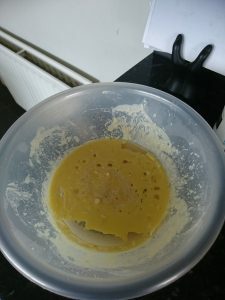 13) When completely melted pour the mixture again through your filter and in to the bowl, leaving to cool a second time for around an hour. Once it’s cooled as you can see you get a much cleaner wax than the previous time. You can repeat this process as many as times as you like to get the purity you require. Now you’ve got your beeswax ready you can start making your lotion. I made two different batches so needed to two jars, if you only intend on doing one batch you will only need one jar and one dish cloth for this part. The recipe is really very simple; you need 1 part almond oil, 1/2 beeswax, 1/2 coconut oil, and then scent to your preference. 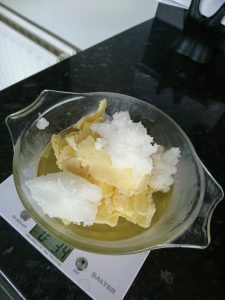 I weighed my cooled beeswax which was 3.4oz so my coconut oil should also be 3.4oz and the almond oil double at 6.8oz. 1) Place the dish cloth and an elastic band over the top of the jars you intend your finished product to be in. This acts as a final filter to make sure no grit or dirt enters your product. 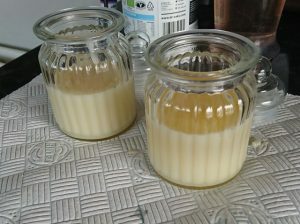 Put your jars to the side until you are ready to pour your lotion mixture in. 3) Measure out all your ingredients and add them to the bowl, but do not add any essentials oils at this point. 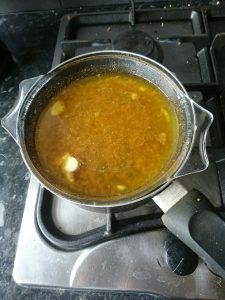 4) Place your bowl over the saucepan on a medium heat to let the mixture melt. Occasionally stiring will help the whole mixture melt but it should take around 20 minutes. Once this is completely melted the mixture will be translucent and you’re ready to pour in to your jars. 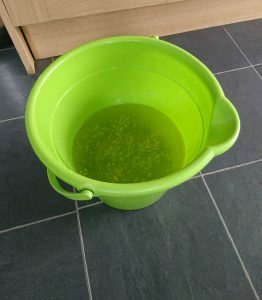 5) If you want to do two variations (different scents or oils) you should measure half your mixture in to the jug (use scales for accuracy) then add your oils or scent, then repeat for your separate batch. 6) I added around 8 drops of lavender oil but you can do this to your preference. Give it a quick stir and then pour in through your dishcloth filter in to your empty jar. That’s it, all that needs to be done now is leave the mixture to set! Most essentials oils act as a preservative and the ingredients in this recipe are fairly stable with long shelf-life so this shouldn’t present too much of an issue, however you can add one if you feel necessary.